The DWR Sunday Religious Disservice – One of these things doesn’t belong in the bible. Mak, Arb’s weird commenting sometimes ends up with us all writing nonsense at each other!! Yep. Course I meant to agree with you that I am yet to find one independent woman in the bible. Ha. But at least you have met one on the internets! With a few added conventions, the “@person and” some quoting all is quite intelligible. I guess we’ll just have to celebrate our differences and work toward a brighter future! Oh hey, you said you were working on a gritty feminist piece, how is that coming along? No. I said there were more sexual crimes, rapes, DV against women and girls in the UK according to official stats. Been there, written that, want the follow-up? Ah, okay. I misunderstood what you meant. Also, behind the times, just saw the article on the RS blog. I probably shouldn’t have ruined the fun for those of us that didn’t know the answer before hand. OK, so what exactly are you suggesting in your title, Arb, when you say one of these things doesn’t belong in the Bible? Uh-oh, I thought the correct answer was Satan. A little digging brought me to this. – So it very well could be a translation error – since Unicorns as we imagine them today are not the ‘unicorns’ mentioned in the bible, but as the evidence suggests – a wild ox. ” The Hebrew word represented in the King James Version by “unicorn” is re’em, which undoubtedly refers to the wild ox (urus or aurochs) ancestral to the domesticated cattle of today. The re’em still flourished in early historical times and a few existed into modern times, although it is now extinct. It was a dangerous creature of great strength and was similar in form and temperament to the Asian buffaloes. The wild ox was a favorite prey of the hunt-loving Assyrian monarchs (the animal was called rumu in Assyrian, essentially the same word as re’em) and was displayed in their large bas-reliefs. Here the wild ox was invariably shown in profile and only one horn was visible. One can well imagine that the animal represented in this fashion would come to be called “one-horn” as a familiar nickname, much as we might refer to “longhorns” in speaking of a certain breed of cattle. As the animal itself grew less common under the pressure of increasing human population and the depredations of the hunt, it might come to be forgotten that there was a second horn hidden behind the first in the sculptures and “one-horn” might come to be considered a literal description of the animal. 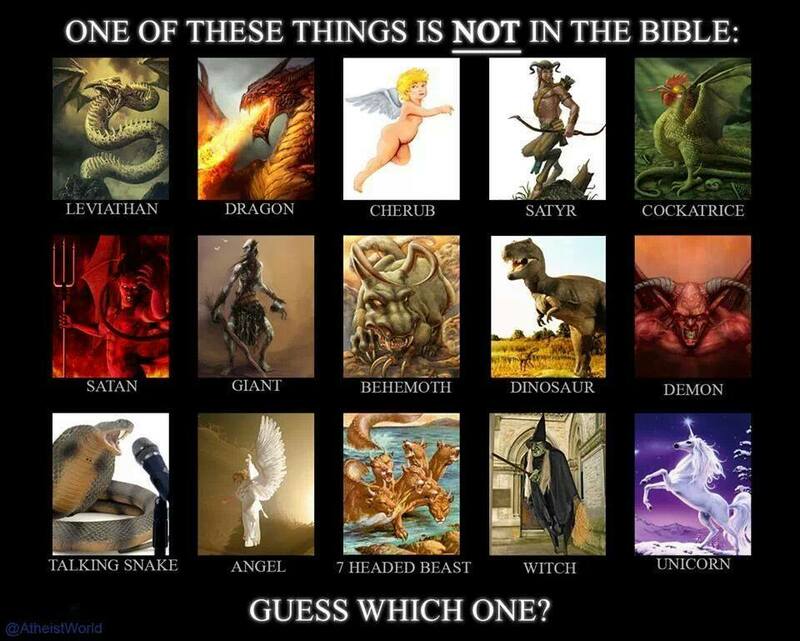 I’m pretty sure the original intent of the image, though somewhat misleading, was to demonstrate that there’s only one listed in the image we actually have evidence for, which is the dinosaur. Unlike the other terms in the image, the term, dinosaur, is not specifically mentioned in any of the translations. Satan as depicted in the picture does not appear in the bible. It depicts a lord of hell type of being that is never actually described in the bible. Satan, in the specific cases NN points out is simply an opponent to “The Lord”. Some other misconceptions is that Satan is the serpent, the beast, or lucifer. Again, there is no biblical evidence for any of those things. What Satan actually is is actually satan or the satan which is an accuser. So does the word Satan appear in the bible? Yes. Does it describe the being shown in the picture? No. OK, if that’s the direction you want to go in, my top picks would also include the talking snake speaking into the microphone, the Halloween witch riding a broom, and the blonde, naked baby with wings (cherub)..
« Women – Just too *hard* to animate.